Thinking about life after school can be daunting when you don’t have a clue about what it is that you want to do. At school, I would go blank when talking about careers and often found myself making things up when friends and teachers asked the dreaded question… What do you want to be? If it’s theatre or the performing arts that you are passionate about but don’t really fancy being on stage, there are surprisingly hundreds of options for you to explore backstage and behind the scenes. Some of them, you might not ever have even considered. There is a role for everyone in theatre and despite not being on stage, all roles still require creativity and the sector relies on a whole range of talents, skills and people from a wide range of backgrounds. Although pursuing a career in theatre and the arts can be very competitive and require lots of hard work and perseverance, it can be an incredibly exciting, rewarding and fun sector to be a part of with lots of creative and interesting people very keen to support you along the way. Your job in 1-2 sentences: For Prague Youth Theatre I’m in charge of the social media output, day-to-day administration and smooth-running of the company. For the Fringe festival I’m basically responsible for making sure that all the various elements come together at the right time to make a successful event- sounds simple but it’s anything but! Did you always want to work in theatre/arts? Yes! But it took me a while to work out that there are so many other opportunities available other than being on the stage. Advice for making it? Try lots of different roles and use the experiences from each one to build up your skill-set. There are NO bad experiences, everything you go through will help your learning curve. Be willing to volunteer or intern to ‘get a foot in the door’, the theatre world tends to be quite small so it’s often the personal connections you make will lead to future opportunities. As well as having good actors on stage, theatre requires costume and set design that will have a visual impact on the audience, illustrate what the script and director want to show its audiences and bring the production to life. These areas require artistic individuals to design and make items, liaise with the artistic director and know the script, characters and actors inside out. There are lots of quality courses in both Set Design and Costume Design in universities and conservatoires across the world where you can learn the skills to succeed however many people gain recognition for their work through lots of work experience too. Check out this awesome video from the costume designers of WICKED The Musical. Theatre directors often start off as actors or playwrights although many also develop skills by beginning as directors of small projects such as school and university productions. They are responsible for practically and creatively interpreting scripts and scores. Directors oversee a production or show from start to finish and are involved in the design, rehearsals and pre-production stages whilst working closely with the production, creative and administration teams. There are lots of opportunities within education if you want to share your passion for theatre and help young people and even adults to build confidence, skills and express themselves. This could involve teaching and directing drama and acting in schools or in youth theatre. 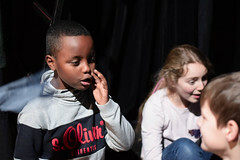 Drama facilitators creatively deliver theatre and drama workshops and courses to a range of people in a range of environments including schools, hospitals, prisons and community centres. Your job in 1-2 sentences: I play games all day! But very very carefully structured games! Have you always wanted to work in theatre/arts? My father had me help him learn lines when he was in a production of Samuel Beckett’s Endgame. I was 5. I had no idea what I was saying. I fell in love with it. Advice for making it? Make a 5 year plan. Then throw the plan out in 3 months because something unexpected and amazing happens that pushes your career in a different direction! This is an area to consider if you have a flair for creative writing. Theatre journalists review shows for newspapers, magazines and websites and often get tickets for free in doing so! They might write articles about the state of the arts and report and discuss what’s new and happening in the world of theatre. If this is something that you fancy having a go at, you could start off by writing reviews of the shows that you see and upload these to your own blog to get practice. Get feedback from your teachers, friends and family to help you to develop your writing. Lots of websites and blogs are always looking for young contributors so keep your eyes peeled for opportunities. Nancy Groves wrote an insightful article for The Guardian on how to make it into arts journalism. Production teams are integral to bringing a performance to life and their work is both artistic and technical. Whether it is lighting or sound that you are interested in or even both, the production team works closely with the artistic director and set designer to create scenes that will draw the audience in and express particular moods and atmospheres. Watch this video to hear from the Head of Lighting at MAMMA MIA! Make-up artists and hair and wig stylists provide the all-important finishing touches to a character, sometimes completely transforming an actor’s appearance. Larger companies often employ a whole team of full-time make-up, hair and wig professionals! You could start to look for inspiration in history books, films and paintings to gain knowledge of styles and looks across centuries and cultures. Perhaps you might want to test your skills out on your family and friends? Watch this video to see how the hair, wig and make-up department operates at the Royal Opera House in London. Playwrights-or dramatists- are responsible for writing the production or even adapting an original script. Playwrights might work independently or they might work regularly in conjunction with the director and actors. Some playwrights start off as actors or directors, but many others just have a passion for writing and storytelling. Watch this video from the National Theatre, London to hear eight contemporary playwrights provide top advice for writing. Stage Managers are integral to the coordination of a production and are responsible for anything from scheduling and running rehearsals to making sure that tech staff and performers are in the right place and from calling cues to liaising with Front of House staff. Stagehands work alongside Stage Managers and provide support in the form of a number of tasks such as moving scenery and props in between scenes and setting up rigging and special effects. Lots of Stage Managers will have their stint at being a Stagehand before taking the lead. Watch this video to hear from a Stage Manager on Broadway. Unsure of what to do next? Make an internet search if any of these roles sounds interesting to you to find out more about what the role entails, what you need to do to get there and hear from the people who are currently in these roles. There are lots of routes and pathways into these roles and although going to university can be useful, it is not essential. For example, there are lots of brilliant apprenticeships that will get your first rung on the ladder. Talking to people in the industry can help to give an insight into the working day and the lowdown on how they got to where they are today. Asking your drama teacher at your school might be a good place to start. You never know how important these contacts or the advice that they give might be to you in the future. Getting involved in theatre at school or at a local youth theatre is a good way to explore any of these roles. School and youth productions often need extra hands to manage lighting and sound and work backstage which will give you first-hand knowledge and understanding of theatre operations. Look out for volunteering or part-time job opportunities at your local theatre or theatre company. It will give valuable hands-on experience and will equip you with skills to develop your understanding of what is needed in the industry. Internships are another great way to explore theatre careers. Prague Youth Theatre offer internships to those interested in a wide range of areas and regularly welcome international interns. If you are interested in finding out more about this, drop us a line. Above all, you should always believe in yourself and be your biggest supporter when finding the right path. Don’t feel restricted by what other people say you can or can’t do. Its also totally fine to change your mind about things at any point in your life. People have career changes at 25 and 55 and there is plenty of help and resources out there to help you to do this. As long as you are passionate, hardworking and keen to learn, then theatre will always be open to you. Next Post My First Day at PYT: A Baptism of Fire!